Horse of the Year A.P. 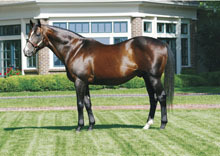 INDY was North America’s Champion Sire twice in the past five years In 2007, he was the nation’s leading sire by Graded stakes winners, stakes wins, and yearling average. A.P. Indy has sired 110 stakes winners, 64 Graded winners, and 21 Grade I winners. 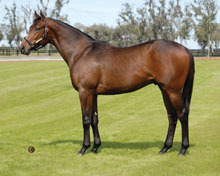 He is siring 11.6% stakes winners from foals, and his sons include some of the industry’s most sought-after stallions. 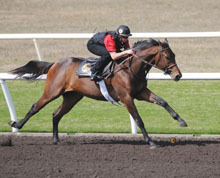 Grade I winner BUY THE SPORT is a versatile multiple stakes winner who won a one-mile stakes on grass in England, and the 1 1/8-mile Gazelle H.-G1 on dirt at Belmont in her North American debut. She is one of four stakes winners from her dam. The breeding cross of A.P. Indy or his sons and Hail to Reason line mares has already produced 14 stakes winners, including Grade I winner and sire Golden Missile.